Registration for Your Cycle. Your Month is now closed. We are blown away by how many people have signed up for the course: 82 people! We aren't sure whether we are going to be running the course again, but if you are interested then sign up below and we will let you know any updates and new course dates. Posted on January 17, 2018 by Hedvig Murray. Today (16th January, 2018) is the last chance to register for Your Cycle. Your Month. If you want to find out more about the course, you can read more about it here. Registration closes at midnight (U.K. time) and the course starts tomorrow! This is the first time we are running this course, and we don't know if we are going to run it again. Plus this time it is free, and if there is a next time we might charge for it. Posted on January 16, 2018 by Hedvig Murray. Register for the course here. When you fill in the form, you will be sent an email with a downloadable course guidebook, and a link to join the course facebook group. There are five modules to the course. For each module you'll be sent a downloadable booklet to read with some exercises to fill out. There are also live coaching calls every week. And a private facebook group that you can join. What is the workload for the course? Reading the booklet and doing the exercises should take around 1-2 hours. There is a weekly coaching call that lasts 1 hour. And then it's up to you what further reading, cooking, eating, moving, project work you do. Will I still have access to the information after the course ends? You will have the booklets. We aren't sure about the facebook group and the recordings of the coaching calls. This is the first time we are running the course, and so it depends how it goes. But we will give you plenty of warning. Do I have to be on Facebook to join the course? No. The course material will be sent to your email, as will links to the coaching calls. Unfortunately, if you aren’t on Facebook you won’t have access to the community group. I will be away during the course. Will I still get the information? Yes. The course material will be sent to you in your email. You will just need to set your own dates that work for you. Can I join after the 16th January? No. We are being strict about that because we want to create a community of people that are doing it together. We are considering running the course again, but have no dates yet. Where is the course going to be held? The course is going to be held online, so you can join from anywhere in the world. Can I still ask a question if I can’t make the live coaching call? Yes. Just email it to us ahead of time. Do I have to be menstruating? No. Anyone can join, and you can pick the most appropriate cycle for you (either your menstrual cycle or the lunar cycle). Do you believe the moon impacts how we feel and behave? It doesn’t really matter what we believe about the moon. Regardless of what you believe, we believe there are benefits to using the cycle of the moon as a guide. Posted on January 11, 2018 by Hedvig Murray. 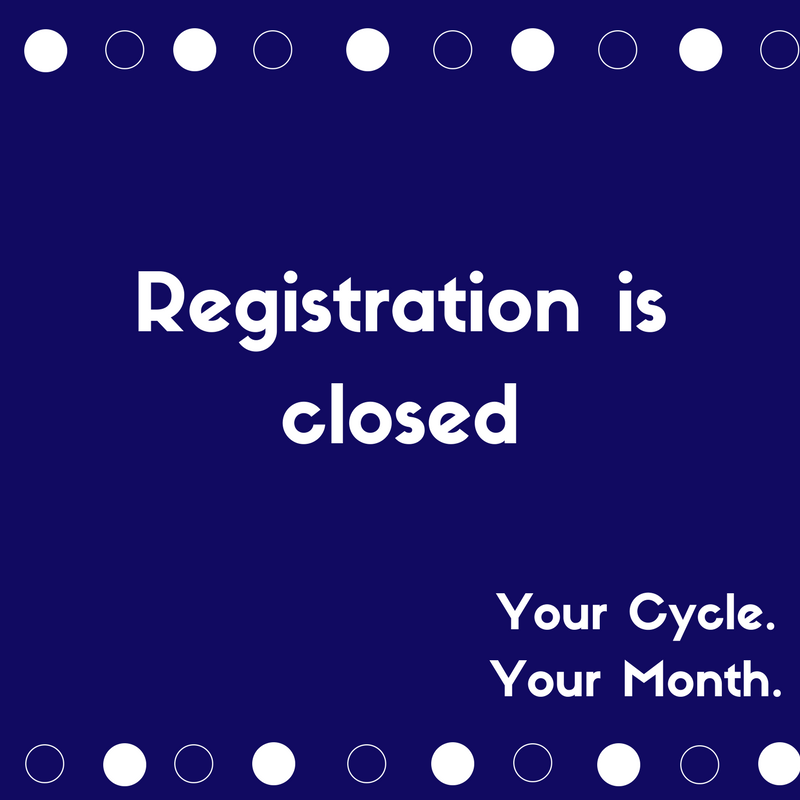 Registration for 'Your Cycle. Your Month' is now open! But don't wait too long to register because registration closes on 16th January! When you register for the course, you get links to the downloadable course guide book and the facebook group we've created for the course. Working with Hedvig is beyond helpful! Hedvig is a magician when it comes to untangling my ideas. She has the ability to make them tidy, clear bullet points with actions and deadlines to help motivate me! Just what I needed. Things are getting done now! We know that what we do can make a real difference, because it has made a difference in our lives. Yes, I have been Abi's client and she has been mine. And that's when we had the idea of combining what we do and turning it into a course. And now you can join us in a course that combines life design, nutritional therapy, menstruality education and more. It's something we believe all women (and men) should know about that's why we are offering it for free and online. The course starts on January 17th. It lasts 5 weeks, and each week we'll send you some of the ideas, suggestions, exercises and tools that we normal share in with our clients. We will also be having weekly group coaching calls. And we have created a Facebook group just for people on the course to help connect with other like-minded people. Posted on January 10, 2018 by Hedvig Murray. Introducing ‘Your Cycle. Your Month’ Course. I get it. You really want to change your life. But you get stuck, doubt yourself, burn out. It's super frustrating and demoralising. A few years ago, I was in that same place. I would start things and give up. But then I found out about a tool, and started using it in my own life. Using the menstrual cycle (or lunar cycle) as a framework to make sustainable life changes. I’ve been reluctant to talk about it because it sounds so woowoo, but it's made such a difference to my life. It is now a fundamental tool for how I design my month, so I want to share it so you can also benefit from it. So I’ve teamed up with the person who got me started on all of this: nutritional therapist, yoga teacher and menstruality educator and friend, Abi from Nutrition For Change. Together, we’re bringing you the best of our coaching practice, but in the shape of a course. how to use this cycle to make a personal project happen. Winter: starting on 17th January. The new moon. Menstruation. Summer: starting on 31st January. The Full Moon. Ovulation. Autumn: starting on 7th February. The 3rd quarter moon. Luteal. Winter: starting on 16th February. The new moon. Menstruation. The course ends on the 22nd February. At the start of each new season, we’ll email you with info, suggestions and ideas for how to design that season. We have also created a facebook group, just for this course, as a safe space for you to share with other like-minded people. During the season we’ll share more fun stuff, ideas and plenty of encouragement on the group. As a bonus, each season we will also do a live coaching call, so that we can answer your questions. Registration is now open! Closes 16th January 2018. Posted on January 9, 2018 by Hedvig Murray. An alternative to new year resolutions and an exciting announcement! Are you doing resolutions this year? I used to make them. I jumped at the chance to make a change to my life. But I, like most people, didn't stick with it for the whole year, and then I felt bad about it and beat myself up. Can you relate? What I've come to realise is wasn't because I can't make changes in my life (I made plenty of them) but because I didn't have enough support, and I didn't know something that I believe is critical for women to understand. Since then I have developed an alternative that works much better for me, and I want to share it with you. Let's back up. In 2014, I was living in Brighton and working in the field of sustainability. I found it super rewarding, but it was also a struggle. Ironically, it was personally and financially unsustainable. I had health issues like eczema (a sign of stress). I often felt really tired even if I slept ok, and I certainly didn't make (or take) enough time to rest unless I was really ill. I couldn’t afford things like decent winter boots (an important thing when working outside. I was chasing and chasing and it didn’t add up. Along the way I met Abi. She lived around the corner from me, and before long we were getting up to all sorts of fun adventures together: creating community gardens, I helped her with her garden, we went sea swimming together. We also worked together. She took courses with me, and became a client and I helped her re-design her garden and life. I also became Abi's client. As a nutritional therapist, she helped me understand my health holistically rather than just focusing on the symptoms. The changes she suggested to my food and lifestyle helped me manage my stress, and irregularities with my menstrual cycle. This began my re-education about my menstrual cycle. Did you know that menstruating women go through four different hormonal phases every month? Menstruation, follicular, ovulation and luteal. I certainly didn't, well not in a meaningful way. One day it clicked… these phases are like seasons, with menstruation being like winter and ovulation like summer. (I’ve since come across others that also think of them as seasons, so I am by no means the first). This new understanding of the hormonal changes I go through helped me re-design my month according to my seasons, and also helped me have a lot more empathy for myself. And now I am continuously tweaking my life through the year, rather than just at the beginning. I have been reluctant to talk about online because it felt so… well... wooowooo and taboo. But I believe this is information all women should know about, and yet… I don’t know about you… but this wasn’t part of anything I learnt about when I got my period. And now for the exciting bit. Over the last few months, Abi and I have been collaborating to bring this information to you. Abi is bringing her knowledge and experience as a trained nutritional therapist, yoga instructor and menstruality educator and I’m bringing my knowledge and experience in life design and coaching. The idea is that we lead you through a month, looking at the different hormonal phases, what to do during those different phases, what to eat and different ways to move. We want to make it inclusive to women (and also men) who aren’t having periods, or whose periods aren’t regular so we will structure our month by the moon, and we will start with the new moon on 17th January. Before then, here's something to get you started. A seasonal calendar is the basis of re-designing your month, and year. I find a seasonal calendar really helpful when I’m planning my month and also organising things, so I can work with my seasons and not against them. Paper calendar- mark different coloured dots by the different days of the month. Create four different calendars one for each seasons. I like to use different colours for each season. My Seasonal Calendar using Google Calendar. Use the moon and the different phases as the basis from you calendar. Here's a link to find out that the dates of the different moon phases in 2018 (with this one you can also change your location to give you accurate info for where you live. If you are menstruating, but don’t track your cycle. For this month, use the moon phases and the link above. When you get your period, mark that in your calendar, and record how long you have it. You can also note down any other observations along the way re your physical and emotional health. So... here's to re-designing your 2018, month by month... according to your seasons. Posted on January 2, 2018 by Hedvig Murray.